"Railway sleeper" redirects here. For passenger cars with beds, see sleeping car. Wooden ties are used on many traditional railways. In the background is a track with concrete ties. 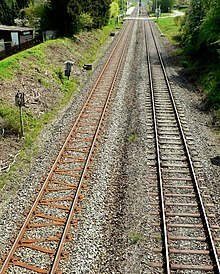 A railroad tie or crosstie (American English) or railway sleeper (British English) is a rectangular support for the rails in railroad tracks. Generally laid perpendicular to the rails, ties transfer loads to the track ballast and subgrade, hold the rails upright and keep them spaced to the correct gauge. Railroad ties are traditionally made of wood, but pre-stressed concrete is now also widely used, especially in Europe and Asia. Steel ties are common on secondary lines in the UK; plastic composite ties are also employed, although far less than wood or concrete. As of January 2008, the approximate market share in North America for traditional and wood ties was 91.5%, the remainder being concrete, steel, azobé (red ironwood) and plastic composite. 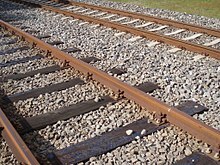 The crosstie spacing of mainline railroad is approximately 19 to 19.5 inches for wood ties or 24 inches for concrete ties. (The spacing means the distance of the center of one tie to the center of the next tie, and equals to the width of one tie plus the width of one crib.) The amount of ties is 3,250 wooden crossties per mile (2019 ties/km, or 40 ties per 65 feet) for wood ties or 2640 ties per mile for concrete ties. 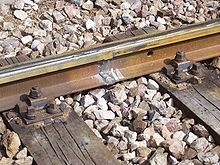 Rails in the US may be fastened to the tie by a railroad spike; iron/steel baseplates screwed to the tie and secured to the rail by a proprietary fastening system such as a Vossloh or Pandrol are commonly used in Europe. The type of railroad tie used on the predecessors of the first true railway (Liverpool and Manchester Railway) consisted of a pair of stone blocks laid into the ground, with the chairs holding the rails fixed to those blocks. One advantage of this method of construction was that it allowed horses to tread the middle path without the risk of tripping. In railway use with ever heavier locomotives, it was found that it was hard to maintain the correct gauge. The stone blocks were in any case unsuitable on soft ground, such as at Chat Moss, where timber ties had to be used. Bi-block ties with a tie rod are somewhat similar. Historically wooden rail ties were made by hewing with an axe, called axe ties or sawn to achieve at least two flat sides. A variety of softwood and hardwoods timbers are used as ties, oak, jarrah and karri being popular hardwoods, although increasingly difficult to obtain, especially from sustainable sources. Some lines use softwoods, including Douglas fir; while they have the advantage of accepting treatment more readily, they are more susceptible to wear but are cheaper, lighter (and therefore easier to handle) and more readily available. Softwood is treated, while creosote is the most common preservative for railway ties, preservatives are also sometimes used such as pentachlorophenol, chromated copper arsenate and a few other preservatives. Sometimes non-toxic preservatives are used, such as copper azole or micronized copper. New boron-based wood preserving technology is being employed by major US railroads in a dual treatment process in order to extend the life of wood ties in wet areas. Some timbers (such as sal, mora, jarrah or azobé) are durable enough that they can be used untreated. Problems with wooden ties include rot, splitting, insect infestation, plate-cutting, also known as chair shuffle in the UK (abrasive damage to the tie caused by lateral motion of the tie plate) and spike-pull (where the spike is gradually loosened from the tie). For more information on wooden ties the Railway Tie Association maintains a comprehensive website devoted to wood tie research and statistics. Wooden ties can, of course, catch fire; as they age they develop cracks that allow sparks to lodge so that they catch fire more easily. Concrete ties are cheaper and easier to obtain than timber[dubious – discuss] and better able to carry higher axle-weights and sustain higher speeds. Their greater weight ensures improved retention of track geometry, especially when installed with continuous-welded rail. Concrete ties have a longer service life and require less maintenance than timber due to their greater weight, which helps them remain in the correct position longer. Concrete ties need to be installed on a well-prepared subgrade with an adequate depth on free-draining ballast to perform well. Concrete ties amplify wheel noise, so wooden ties are often used in densely populated areas. On the highest categories of line in the UK (those with the highest speeds and tonnages), pre-stressed concrete ties are the only ones permitted by Network Rail standards. 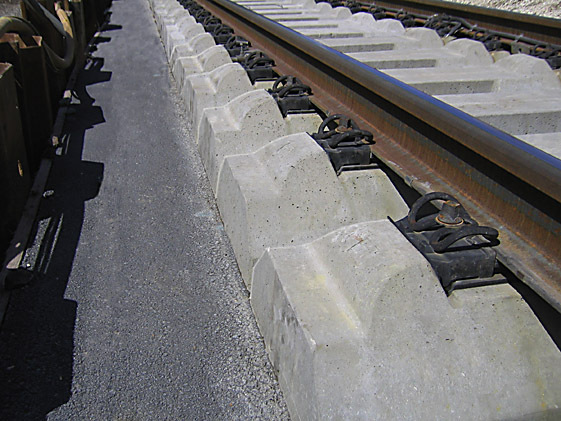 Most European railways also now use concrete bearers in switches and crossing layouts due to the longer life and lower cost of concrete bearers compared to timber, which is increasingly difficult and expensive to source in sufficient quantities and quality. Steel ties are formed from pressed steel and are trough-shaped in section. The ends of the tie are shaped to form a "spade" which increases the lateral resistance of the tie. Housings to accommodate the fastening system are welded to the upper surface of the tie. Steel ties are now in widespread use on secondary or lower-speed lines in the UK where they have been found to be economical to install due their ability to be installed on the existing ballast bed. Steel ties are lighter in weight than concrete and able to stack in compact bundles unlike timber. Steel ties can be installed onto the existing ballast, unlike concrete ties which require a full depth of new ballast. Steel ties are 100% recyclable and require up to 60% less ballast than concrete ties and up to 45% less than wood ties. Historically, steel ties have suffered from poor design and increased traffic loads over their normally long service life. These aged and often obsolete designs limited load and speed capacity but can still be found in many locations globally and performing adequately despite decades of service. There are great numbers of steel ties with over 50 years of service and in some cases they can and have been rehabilitated and continue to perform well. Steel ties were also used in specialty situations, such as the Hejaz Railway in the Arabian Peninsula, which had an ongoing problem with Bedouins who would steal wooden ties for campfires. Modern steel ties handle heavy loads, have a proven record of performance in signalized track, and handle adverse track conditions. Of high importance to railroad companies is the fact that steel ties are more economical to install in new construction than creosote-treated wood ties and concrete ties. Steel ties are utilized in nearly all sectors of the worldwide railroad systems including heavy-haul, class 1s, regional, shortlines, mining, electrified passenger lines (OHLE) and all manner of industries. Notably, steel ties (bearers) have proven themselves over the last few decades to be advantageous in turnouts (switches/points) and provide the solution to the ever-growing problem of long timber ties for such use. When insulated to prevent conduction through the ties, steel ties may be used with track circuit based train detection and track integrity systems. Without insulation, steel ties may only be used on lines without block signaling and level crossings or on lines that use other forms of train detection such as axle counters. In more recent times, a number of companies are selling composite railroad ties manufactured from recycled plastic resins and recycled rubber. Manufacturers claim a service life longer than wooden ties with an expected lifetime in the range of 30–80 years, that the ties are impervious to rot and insect attack, and that they can be modified with a special relief on the bottom to provide additional lateral stability. In some main track applications the hybrid plastic tie has a recessed design to be completely surrounded by ballast. Aside from the environmental benefits of using recycled material, plastic ties usually replace timber ties soaked in creosote, the latter being a toxic chemical, and are themselves recyclable. Hybrid plastic railroad ties and composite ties are used in other rail applications such as underground mining operations, industrial zones, humid environments and densely populated areas. Hybrid railroad ties are also used to be partly exchanged with rotten wooden ties, which will result in continuous track stiffness. Hybrid plastic ties and composite ties also offer benefits on bridges and viaducts, because they lead to better distribution of forces and reduction of vibrations into respectively bridge girders or the ballast. This is due to better damping properties of hybrid plastic ties and composite ties, which will decrease the intensity of vibrations as well as the sound production. In 2009, Network Rail announced that it would begin replacing wooden ties with recycled plastic ones made by I-Plas Ltd of Halifax, West Yorkshire; but I-Plas became insolvent in October 2012. The Cable TV series Factory Made has a segment on the manufacture of plastic ties. In 2012, New Zealand ordered a trial batch of "EcoTrax" brand recycled composite ties from Axion for use on turnouts and bridges, and a further 3-year order in 2015, but then Axion filed for bankruptcy in December 2015, though it continues to trade. These ties are developed by Dr. Nosker at Rutgers University. Ties may also be made from fiberglass. An unusual form of tie is the Y-shaped tie, first developed in 1983. Compared to conventional ties the volume of ballast required is reduced due to the load-spreading characteristics of the Y-tie. Noise levels are high but the resistance to track movement is very good. For curves the three-point contact of a Y steel tie means that an exact geometric fit cannot be observed with a fixed attachment point. The cross section of the ties is an I-beam. As of 2006 less than 1,000 km (621 mi) of Y-tie track had been built, of which approximately 90 percent is in Germany. The ZSX Twin tie is manufactured by Leonhard Moll Betonwerke GmbH & Co KG and is a pair of two pre-stressed concrete ties longitudinally connected by four steel rods. The design is said to be suitable for track with sharp curves, track subject to temperature stress such as that operated by trains with eddy brakes, and bridges, and as transition track between traditional track and slab track or bridges. Concrete monoblock ties have also been produced in a wider form (e.g. 57 cm or 22 1⁄2 in) such that there is no ballast between the ties; this wide tie increases lateral resistance and reduces ballast pressure. The system has been used in Germany where wide ties have also been used in conjunction with the GETRAC A3 ballastless track systems. Bi-block (or twinblock) ties consist of two concrete rail supports joined by a steel bar. Advantages include increased lateral resistance and lower weight than monobloc concrete ties, as well as elimination of damage from torsional forces on the ties center due the more flexible steel connections. This tie type is in common use in France, and are used on the high-speed TGV lines. Bi-block ties are also used in ballastless track systems. Frame ties (German: Rahmenschwelle) comprise both lateral and longitudinal members in a single monolithic concrete casting. This system is in use in Austria; in the Austrian system the track is fastened at the four corners of the frame, and is also supported midway along the frame. Adjacent frame ties are butted close to each other. Advantages of this system over conventional cross increased support of track. In addition, construction methods used for this type of track are similar to those used for conventional track. In ladder track the ties are laid parallel to the rails and are several meters long. The structure is similar to Brunel's baulk track; these longitudinal ties can be used with ballast, or with elastomer supports on a solid non-ballasted support. Various methods exist for fixing the rail to the railroad ties. Historically spikes gave way to cast iron chairs fixed to the tie, more recently springs (such as Pandrol clips) are used to fix the rail to the tie chair. In recent years, wooden railroad ties have also become popular for gardening and landscaping, both in creating retaining walls and raised-bed gardens, and sometimes for building steps as well. Traditionally, the ties sold for this purpose are decommissioned ties taken from rail lines when replaced with new ties, and their lifespan is often limited due to rot. Some entrepreneurs sell new ties. Due to the presence of wood preservatives such as coal tar, creosote or salts of heavy metals, railroad ties introduce an extra element of soil pollution into gardens and are avoided by many property owners. In the UK, new oak beams of the same size as standard railroad ties, but not treated with dangerous chemicals, are now available specifically for garden construction. They are about twice the price of the recycled product. In some places, railroad ties have been used in the construction of homes, particularly among those with lower incomes, especially near railroad tracks, including railroad employees. They are also used as cribbing for docks and boathouses. The Spanish artist Agustín Ibarrola has used recycled ties from Renfe in several projects. In Germany, use of wooden railroad ties as building material (namely in gardens, houses and in all places where regular contact to human skin would be likely, in all areas frequented by children and in all areas associated with the production or handling of food in any way) has been prohibited by law since 1991 because they pose a significant risk to health and environment. From 1991 to 2002, this was regulated by the Teerölverordnung (Carbolineum By-law), and since 2002 has been regulated by the Chemikalien-Verbotsverordnung (Chemicals Prohibition By-law), §1 and Annex, Parts 10 and 17. ^ "Steel Sleepers in the Rail Industry – they are still made, and have quite a history". Retrieved August 9, 2017. ^ "M/W Budgets To Climb in 2008". Railway Track & Structures. New York, New York: Simmons-Boardman Publishing Company. 104 (1): 18–25. January 2008. ISSN 0033-9016. OCLC 1763403. Retrieved 23 December 2011. ^ Wilcock, David (February 19, 2013). "Railway Engineering 101, Session 38" (PDF). www.ltrc.lsu.edu. p. 15. Retrieved February 19, 2019. ^ Webb, David A.; Webb, Geoffrey V. Gauntt, James C. (ed.). "The Tie Guide" (PDF). www.rta.org. Railway Tie Association. p. 59. Retrieved February 18, 2019. ^ "Development of Comparative Cross-Tie Unit Costs and Values" (PDF). www.rta.org. Prepared for Railway Tie Association by ZETA-TECH Associates, Inc. August 2006. p. 4. Retrieved February 18, 2019. ^ "The Hedjaz Railroad". The Railroad Gazette. 42 (23): 800. 7 June 1907. ISSN 0097-6679. OCLC 15110419. Retrieved 23 December 2011. ^ "Polywood Composite Railroad Ties Facts". Polywood Inc. Retrieved 20 March 2012. ^ a b c Grant (2005), p. 145. ^ Harper (2002), p. 742. ^ La Mantia (2002), p. 145. ^ La Mantia (2002), p. 277. ^ Cromberge, Peter (1 April 2005). "Polymer rail ties being tested for the mining industry". Mining Weekly. Retrieved 23 September 2010. ^ Van Belkom, Aran (30 June 2015). Analysis and comparison of sleeper parameters and the influence on track stiffness and performance. Edinburgh, UK. ^ "Network Rail to replace wooden sleepers with recycled plastic". The Telegraph. 4 May 2009. Retrieved 21 December 2012. ^ "I-Plas Limited". Insolvent Companies.com. 9 October 2012. Archived from the original on 26 January 2013. Retrieved 21 December 2012. ^ "Final phase of KiwiRail turnaround funded". Railway Gazette. Retrieved 2018-08-01. ^ "Axion secures $8 million contract for recycled railroad ties in New Zealand". Recycling Today. Retrieved 2018-08-01. ^ "AXION INTERNATIONAL HOLDINGS, INC". US SECURITIES AND EXCHANGE COMMISSION. May 18, 2016. ^ "ECOTRAX® Composite Railroad Ties for Main Line, Road Crossings, Tunnels, Bridges, Switches & Turnouts". 2016-05-31. Retrieved 2018-08-01. ^ "Axion International Files for Bankruptcy to Sell Assets". WSJ.com. 2 December 2012. ^ "Privatbahn Magazin grants "Innovation Award 2014"" (PDF) (Press release). 13 March 2015. ^ "Recessed hybrid plastic ties". ^ a b February 28, 2006. "Y-Stahlschwelle". Some information derived from a lecture by Prof. Dr.-Ing. Karl Endmann. oberbauhandbuch.de. Archived from the original on 14 August 2007. Retrieved 18 September 2010. ^ Ogilvie, Nigel; Quante, Franz (17 October 2001). 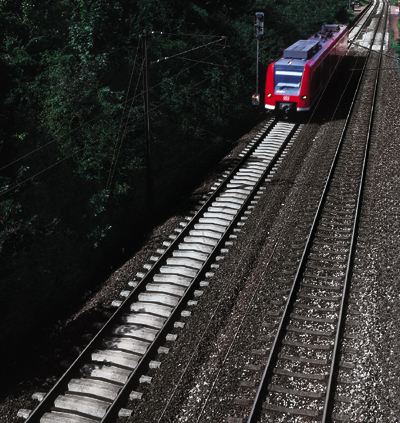 Innovative Track Systems: Criteria for their Selection (PDF) (Report). ProMain. Archived from the original (PDF) on 27 July 2011. Retrieved 23 September 2010. ^ a b c Budisa, Miodrag. "Advanced track design" (PDF). Archived from the original (PDF) on 24 August 2011. Retrieved 23 December 2011. ^ "ZSX Twin Sleeper" (PDF). moll-betonwerke.de. ^ "ZSX Zwillingsschwelle—die besondere Spannbetonschwelle" (in German). gleisbau-welt.de. Archived from the original on 2012-03-07. Retrieved 23 December 2011. ^ "Wide sleepers: so far, so good!". railone.com. Retrieved 23 December 2011. ^ "Wide sleeper track" (PDF). RAIL.ONE GmbH. Archived from the original (PDF) on 7 March 2012. Retrieved 23 December 2011. ^ "Image Ballasted wide sleeper". pfleiderer-track.com. Archived from the original on 2011-07-15. ^ Bachmann, Hans; Unbehaun, Olaf (May 2003). "Wide-sleeper track gains official approval". International Railway Journal. New York, New York: Simmons-Boardman Publishing Corporation. ISSN 2161-7376. Retrieved 23 September 2010. ^ "Ballastless track system GETRAC—Asphalt in top form". railone.com. Retrieved 24 December 2011. ^ "Image Ballastless GETRAC A3 wide sleeper track system". pfleiderer-track.com. Archived from the original on 15 July 2011. Retrieved 23 September 2010. ^ "Traverses béton bi-blocs VDH" (in French). itb-tradetech.com. Archived from the original on 13 July 2011. Retrieved 23 September 2010. ^ a b Bonnett (2005), p. 64. ^ Whitford, Robert K.; Karlaftis, Matthew; Kepaptsoglou, Konstantinos (2003). "Chapter 60. High-Speed Ground Transportation: Planning and Design Issues". In Chen, Wai-Fah; Liew, J.Y. Richard (eds.). The Civil Engineering Handbook (PDF). New Directions in Civil Engineering (2nd ed.). Boca Raton, Florida: CRC Press. Table 60.6 TGV Infrastructure Characteristics for Southeastern and Atlantique Routes. ISBN 0-8493-0958-1. OCLC 248368514. Retrieved 24 December 2011. ^ Klaus Riessberger (January 2004). "Fieldexperience with frame–tie-constructions" (PDF). Institute for Railway Engineering and Transport Economy. trbrail.com. Archived from the original (PDF) on 2011-07-17. Retrieved 22 September 2010. ^ "Chemikalien-Verbotsverordnung" (in German). Bundesministerium der Justiz. Archived from the original on 2010-09-05. Retrieved 23 September 2010. Bonnett, Clifford F. (2005). Practical Railway Engineering. Imperial College Press. ISBN 1-86094-515-5. Cook, J. H. G. (1988). Institution of Civil Engineers (ed.). Urban Railways and the Civil Engineer. Thomas Telford. ISBN 0-7277-1337-X. Flint, E. P.; Richards, J. F. (1992). "Contrasting patterns of Shorea exploitation in India and Malaysia in the nineteenth and twentieth centuries". In Dargavel, John; Tucker, Richard (eds.). Changing Pacific Forests: Historical Perspectives on the Forest Economy of the Pacific Basin. Duke University Press. ISBN 0-8223-1263-8. Grant, H. Roger (2005). The Railroad: The Life Story of a Technology. Greenwood Press. ISBN 0-313-33079-4. Harper, Charles A. (2002). Handbook of Plastics, Elastomers, and Composites (4th ed.). McGraw-Hill. ISBN 0-07-138476-6. Hay, William Walter (1982). Railroad Engineering. Wiley. ISBN 0-471-36400-2. Krylov, Victor V. (2001). Noise and Vibration from High-Speed Trains. Thomas Telford. ISBN 0-7277-2963-2. La Mantia, Francesco (2002). Handbook of Plastics Recycling. Rapra Technology. ISBN 1-85957-325-8. Lancaster, Patricia J. (2001). Construction in Cities: Social, Environmental, Political, and Economic Concerns. CRC Press. ISBN 0-8493-7486-3. Schut, Jan H. (2004). "They've Been Working on the Railroad". Plastics Technology. Retrieved 2007-11-05. Kaewunruen, Sakdirat (2008). Dynamic properties of railway track and its components, Chapter 5 in: New Research on Acoustics. Nova Sciences. ISBN 978-1-60456-403-7. Oaks, Jeff (2006). "Date Nail Info". Retrieved 2007-11-03. Remennikov, Alex M.; Sakdirat Kaewunruen (August 17, 2007). "A review on loading conditions for railway track structures due to train and track vertical interaction". Structural Control and Health Monitoring. Wiley & Sons. 15 (2): 281–288. doi:10.1002/stc.227. Taylor, H.P. (August 17, 1993). "The railway sleeper: 50 years of pretensions, prestressed concrete". The Structural Engineer. Institution of Structural Engineers. 71 (16): 281–288. Smith, Mike (2005). "Track used on British railway lines". Retrieved 2007-11-05. Vickers, R. A., ed. (1992). Cost-effective maintenance of railway track. Thomas Telford. ISBN 0-7277-1930-0. Wood, Alan Muir (2004). Civil Engineering in Context. Thomas Telford. ISBN 0-7277-3257-9. 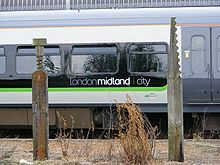 Wikimedia Commons has media related to Rail track sleepers. This page was last edited on 8 March 2019, at 19:04 (UTC).